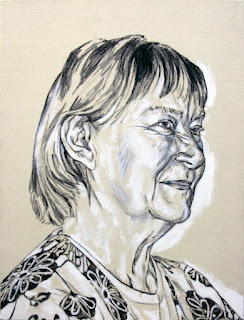 A portrait drawing of Nelly Makovskaia (b. Nelly Troukhina in 1939 Krasnoyarsk, Russia), my brother's Mother-in-law. A ballet dancer from the age of 15. She was offered a place in a ballet school, however her mother was against her going away to another city, so she trained as a chemist in the local university and worked as a research specialist in gas chromatography and air quality analysis (retired 2004). She has lived in St Petersburg since 1967, and serves as a chairman of her condo residents' committee. She danced in the Amature Ballet Company for many years, until 1970 when she stopped to concentrate on her career and daughter. She still has her love of dance, and classical ballet in particular, being a frequent visitor to the Kirov Ballet and to St Petersburg's museums and theatres.